Clarens does not have an official community swimming pool. And there’s no need. 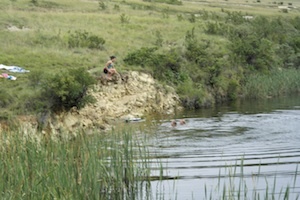 when one can go swimming in the clean, clear, chemical free Kloof Dam in the Clarens Village Nature Reserve. (Maps of the Clarens Village Nature Reserve showing the location of the Kloof Dam are available at the Bibliophile, Old Stone Bottle Store, the Village Grocer and most guest houses.) Whilst everyone is welcome, children are not allowed to swim in the dam without adult supervision. There are also beautiful clear pools where one can take a dip on many of the hiking trails around Clarens, as well as in The Golden Gate Highlands National Park.